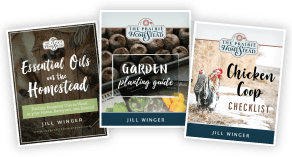 To fight back against the pests, vegetable-eating insects, and biting bugs on your homestead (or backyard). No pesticides or toxic chemicals allowed. Sound impossible? It’s not. BUT it will take some creativity and good old-fashioned homestead ingenuity. If you happen to sustain injuries in your battles, there’s always the DIY Bug Bite Relief Stick. 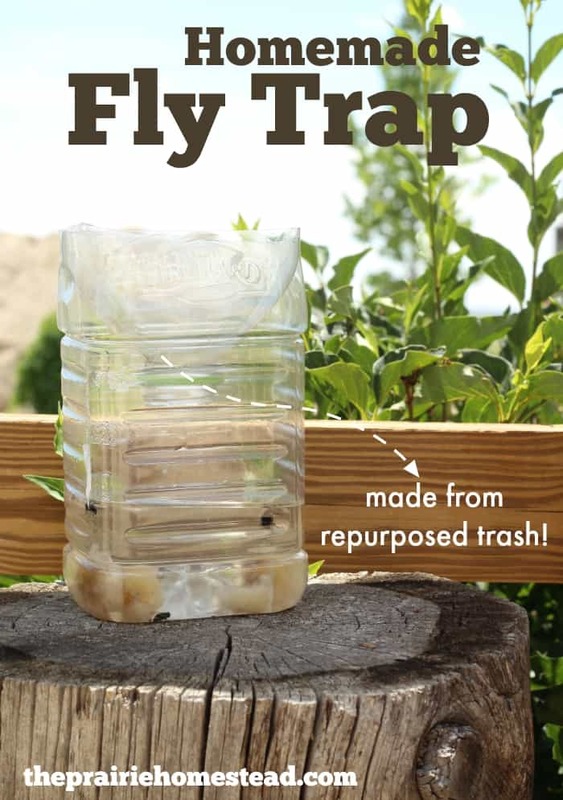 And here’s another heavy-hitter to add to the list: this homemade fly trap made from repurposed trash, so you don’t have to make a trip to the store to buy traps or bait. It doesn’t get much better than that. Let the battle commence! Cut the top of the bottle off. Straight lines are not my forte… Thankfully, my homemade fly trap still works great, thankyouverymuch. Flip the top over, and stick it back into the bottle’s base to form a funnel. You can glue it or tape it, if you like, but mine nestled in there snugly on its own. 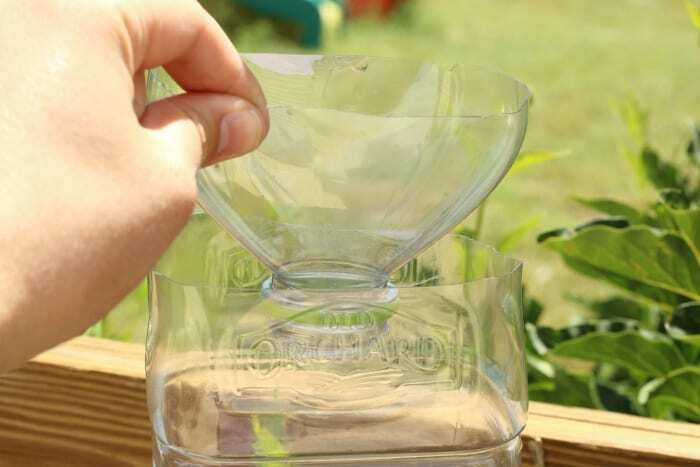 Fill the bottom of the container with a bit of water (a couple inches is enough, just leave a gap between the bottom of the “funnel” and the water). Add some smelly bait, and a drop or two of liquid dish soap. The dish soap clings to the flies wings, and traps them a bit better. Fruit– especially slightly rotten or overripe fruit. Bananas and strawberries work beautifully. 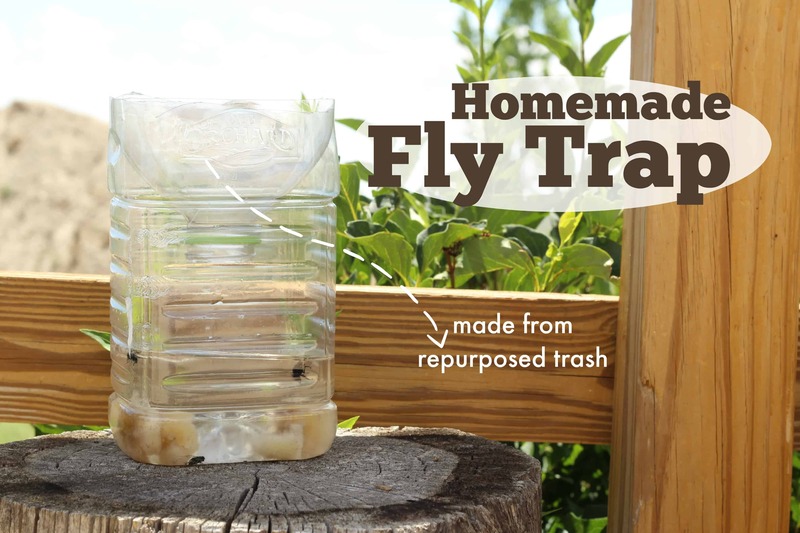 Set your homemade fly trap in a place where the bugs are driving you crazy and you’ll be capturing flies in no time. The theory behind this trap is that the flies will be attracted to the scent and fly down the funnel. However, it’s quite difficult for them to figure out how to fly back up the funnel, and in their efforts to escape, they flop into the water… Then they’re toast. And it works! If you want to hang your homemade fly trap, you can punch holes in the sides and hang it up by a bit of string. Two-liter soda bottles are great for this, but any plastic bottle will do. I used an old juice jug—bonus points for having sticky juice residue inside. Flies been giving a headache at the restaurant & this idea looks promising; soon i’ll have no more stress. Why didn’t I learnt this earlier! I read most of the comments and i love the warrior attitude with your battle on flies…since i started using store bought fly bait traps (found this site so i could make my own)….i have no guests for the fly strips…but i still have a sticky residue from previous victims….does anyone know how to get this stuff off my floor. I know that WD40 works on sticky stuff. Maybe check online if it’ll hurt your floor before using. Perfect timing. It’s been HOT here in Oregon and the doors have been left open too often. Flies. In the house. 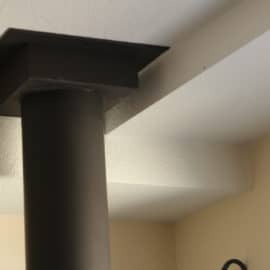 I wanted to just hang up a fly strip in the sun room but my boys thought that would be gross. Somehow I think they will like this. Great tip. Using it today. 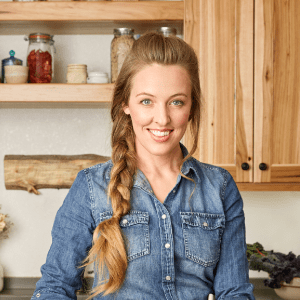 Confession– I do have a fly strip in my kitchen… but this trap is working awesome outside! Hey Jill will this work with cooked meat? Consider investing in carnivorous plants! Venus fly traps, cape sundews, North American pitcher plants.. all good at eating insects like flies. If your having problems with fruit flies North American pitcher plants, sundews, or butterwort plants will take care of them nicely. Assuming that you read this comment I strongly you recommend researching as they are like super low matience pets. As for carnivorous plants, you would need 100 or more to make a dent in he fly population since one of these plants would only eat 1-2 flies per year! I will be using this one for sure on our deck. With four horses now living here I’m noticing a big increase in flies…plus it’s just that time of year again! Oh yes– horses = lots of flies! And if you don’t put soap in the water, you can feed these flies to the chickens. Besides feeding the no soap version of the flies from this fly trap to my chickens, I feed the results of my bug zapper too. I just set a flat container, such as a ground feeder pan for horses, under the bug zapper and let it do its thing overnight. 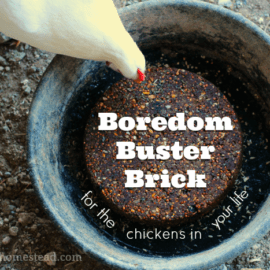 In the morning when I open the chicken coop door it’s a 30 chicken marathon run to that pan under the zapper! They love the toasted bugs and it’s extra protein for them that came at the cost of just a few pennies a night. Is there a natural substance to break the surface tension other than soap so the bugs will be trapped? A little bit of beaten egg maybe? Other suggestions? Would a film of oil on the top do the flies in? You can use Young living dish soap. It is made of plant juice with nothing chemical. Hey Katrin, chemist here: Short answer is no, but oil will do the trick. The only thing that breaks surface tension are chemicals called surfactants, known colloquially as soaps. That said, there are many naturally occurring soaps, including human bile (which you probably don’t want to use), and “ancient soap”, made traditionally by accident, and eventually, intentionally. These traditional soaps, were first made by cooking meat over a wood fire, and having the animal fat drip over the ashes. 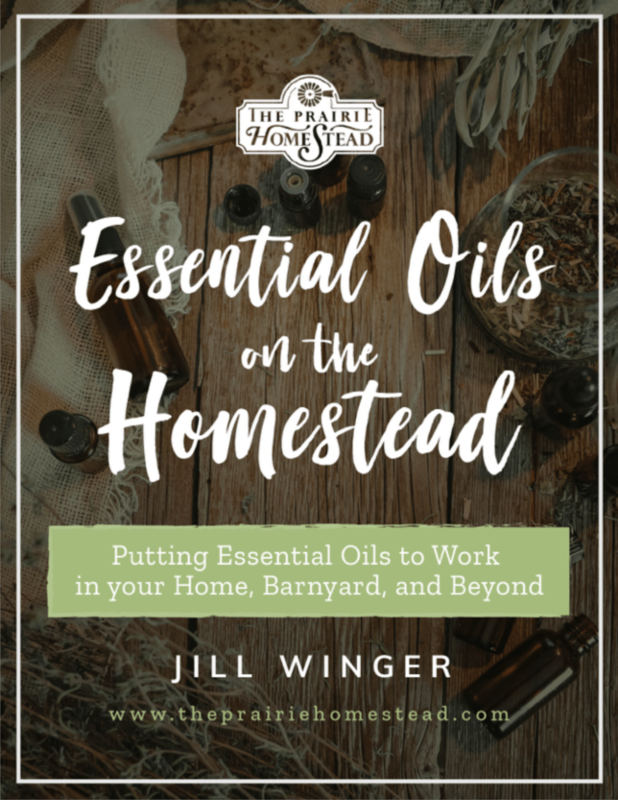 You can similarly make it yourself by taking wood ash or lye (natural sources of NaOH) and mixing it with an animal fat like butter, or even beeswax and plant based oils. Just about any wax or oil will do. This is how natural soaps, were, and still are, made today. However, you don’t want to use soap, so I recommend oil (and any will do), for the same effect. Insects are designed to repel water because it’s so deadly for them. When you add soap to the water, insects can no longer repel the water, so they drown. However, since insects are not designed to repel oil, it behaves like soap and water to them, effectively drowning them. Hornets like sweets; ex: Sugar water or honey water. Note honey water attracts bees. The flying pest are attracted to the bait. Normally, they would be able to float on the surface but by adding a bit of soap to the liquid, it breaks the surface tension causing them to sink and drown. Good tips and research Bob. Thanks! Fly strips – I noticed most of our flies like to land under things, not on the sides of of the fly strip. To launch they just have to let go and drop. So I peeled one side of a fly strip and joined the ends to make a tube, sticky side out. I then used a piece of wire to hang it horizontally. Soon, lots of flies were stuck to the underside of the tube. Then I just rotated the tube to leave a clear bit at the bottom for the next batch of victims. When covered, open the tube, peel off the other side and roll up the other way. Repeat. The other thing I’ve noticed is that some flies prefer black surfaces but I cannot find black fly strips! Yeah, we have a collection of swatters, too! I have the greatest thing. I went out, on the internet, and bought one of those bug-a-salt guns! Your fly swatters really fit their method of evasion. They’re lookin’ for swinging cow tails and the like. Fly swatters are easy for them to avoid. Too much action. With the pump salt shooter you pump up, set the safety off and just casually come up to them and you can get just a few inches away and aim, then fire!. Well, salt in this case. As long as you’re steady they are goners! It’s easy then to see where their body went and give them the ole’ squisheroo! What I love is out doors when the flesh flies are too big to get in the stinky trap or they just can’t seem to make up their mind about goin’ in or not. I shoot ’em with my salt gun! Beats waiting for an undecided customer! Google “balloon slingshot” in Youtube. There are a number of pocket slinkshots made from drink bottles and balloons. Nicely fly-sized, and very inexpensive. Harbor Freight sells an electric fly swatter. You don’t really swat the fly with it. You can trap the fly against A window pane and the electric grid roasts the filthy critter! No bug guts to clean off the window,wall or ceiling! 2 D cell’s operate it and I’m going on my 3rd year in the original batteries. Still going strong. Sometimes H.F. has A coupon for this device, free with another purchase. Can’t beat that! Those Harbor Freight electric bug swats work extra well for mosquitoes! Just wave it around you when you see / hear one and it’ll get them every time. Super smart! And yes, I wonder if black strips would work better! 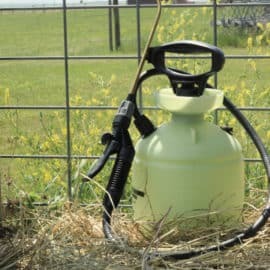 Get some black, plastic plant containers and sticky trap spray from Farm & Garden or hardware store. Spray the plastic containers and put wherever needed. Works great in FL for yellow flies. We hang them from tree limbs. Wasps took over the hummingbird feeders. We sprayed the bases of the feeders, being mindful to not spray the openings or the perches, it trapped the wasps, but the hummers were still afraid of them. We made a wasp/fly trap and that solved the problem. Beverly, I don’t know how to upload pictures. Imagine a cardboard tube lying on a table. Thread a long piece of wire through the tube, then bend the ends up and join them above the middle of the tube to form a triangle. Pick up the top of the wire triangle and the tube hangs horizontally. You can rotate the tube around the wire. Paper with lines appears to get covered more evenly than plain ones, where the flies prefer the edges. Hang the sticky tube up horizontally. When there are lots of flies on the bottom, rotate the tube. These work great! I made some out of wine bottles, then did mosaic on them. Won some ribbons at the state fair with them! I use acv and dawn dish soap in mine. Takes care of those pesky fruit flies! I would love to see some pictures of your wine bottle traps!!! I love this idea! Yep! Apple cider vinegar for fruit flies! I had been using a funnel of recycle paper in a glass jar, but your top fits better! I think the smaller opening makes it harder for them to find the exit. Thank you for an easier idea! I will definitely try this for flies outside!! They are really bad this year. In my experience, gnats/fruit flies love rotting bananas! I tried ACV, sugar water, etc. to no avail. I finally did a DIY gnat trap for my kitchen because they were driving me crazy! It worked so well, I no longer have issues with them, even with fruit lying around. 😮 YEA!!!! I used a small piece of very overripe/rotting banana, a sandwich zip bag, scotch tape, and a small plastic candle cover with the little holes in it (from Bath and Body Works-I know :p, but don’t shop there now), but they came in handy. Any small plastic disc with a few tiny holes should work, (holes about the size of a stick pen cartridge). For fruit flies/gnats I use empty McCormick spice jars. Rinsed out, I put ACV and a drop of dish soap to break the surface tension. They can’t fly out even with all the tiny holes in the lid. Every few days it’s full I just rinse it down the drain and repeat. I’ve even sent the traps to work with my hubby in the break room. I’ll have to make the bigger fly trap now! I use this method and get more wasps & yellow jackets then flies, which is great!! Quick note: the soap reduces the surface tension of the water so that the bugs can fall into it, rather than suspend themselves on top! Great idea, the kids are making one now! Hope it works great for you Brett! Not working for me. They love me much better. I think I may have to resort to the strips for outside, as much as I hate them. Hmmm… bummer. We use the strips too. I save all the tins from tea candles , place them in the bottom of any small jar with a tiny bit of dawn and water ,put a strip of pretty tape around the bottom to hide trapped little buggers place some holes in the lid (witch I also decorate with matching tape ) with a nail or screwdriver . I put banana or pork in tea candle tin depending on what I’m trapping . Place them everywhere with a few cut flowers in them make pretty decorations and the wilted flowers remind me to toss before becoming stinky . At night I put a jar on my table soap water in bottom hang an old banana peel (witch I keep in fridge for this purpose) from top with a scewers stick . Hide in the morning. Same outside while grilling but I use a piece of ripe pork . Happy trapping . My hubs refuses to allow it in the house. Little does he know, I shall plant it somewhere he will never find it. I am SO tired of having to turn off the night lights to discourage those creatures from staying in the bathrooms. Ugh! Down here in Australia it’s 40+ deg and the flies are out in hordes. The commercial version of this fly trap break so easily and require topping up very often. This is a great idea, the container is much larger and can be rehydrated without to much fuss. Thanks, i can sit outside without being smothered in flies. Hope it works great for you Jean! I going to have to try the acv with the spice bottle, we been having troubles with gnats like crazy, and the fly strip isn’t cutting it any more there, I hope it works as good as y’all say there. I don’t have kids, but do have a screen door with pneumatic closers that wear out quickly because the door catches the wind. I’ve solved this for multiple years by putting on 2 pneumatic closers — one near the top and one below the glass. It took a while to adjust them to close at the same rate when installed but it can be done. Each spring I readjust the speed of the closer so that they close quickly again. This might help to narrow the “window” when flies can slip in. Thank you!!! My house was recently, completely, over taken by flies. Okay, maybe not completely, but it has become a fight. These little buggers are resilient!!! I used some pineapple that had went bad. I’ll probably end up adding some other stuff too. Here’s to hoping!! How do you dispose of the mess when it gets too full? I have a big re-usable trap for the barn, but Lor-dee does it smell!!! I tried digging a hole and dumping it in and covering it over, but you could still smell the mess. And i certainly don’t want the dogs digging it up and/or rolling in it! I dump mine at the tree line of my property then recycle the bottle. The only thing that’s not quite nature-friendly is a few drops of dish soap and I highly doubt that’s going to hurt anything. Stick a plastic bag inside. Then put your funnel on. You can avoid seeing dead insects that way too. 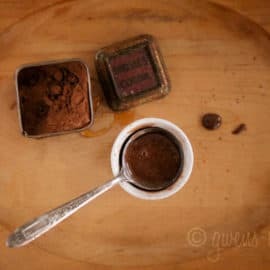 For fruit flies, I take a drinking glass or jar, add a packet of dry yeast, a tablespoon or two of sugar, an inch or two of warm water (to activate the yeast). Then I cut the corner off of a plastic sandwich bag, leaving a small hole just large enough for a fruit fly to enter. I put the bag over the top of the glass or jar with the cut corner extending down into the glass to within an inch of the liquid and secure it with a rubber band about an inch below the outside rim of the glass. If I put the tip of the bag too close, it gets gummed up by the foaming yeast, so I’m careful not to get it too far into the glass, but to have the hole well below the top of the glass because the flies naturally go up. According to our agricultural extension office, the fruit flies are attracted to the carbon dioxide produced by the fermentation process and the yeast mixture produces a higher concentration of CO2, luring the flies away from my fruit. For fruit flies, this mixture has worked far better than apple cider vinegar or any other bait I’ve tried. 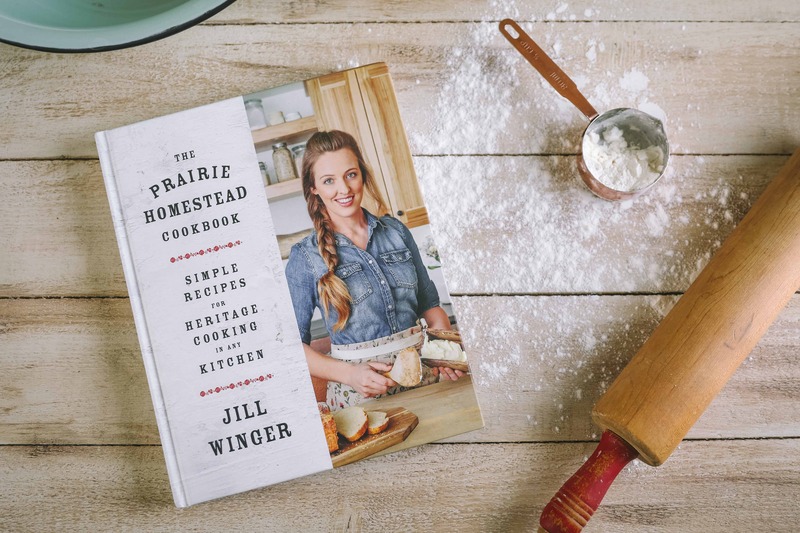 I buy the bulk yeast at the warehouse store for a fraction of the cost of packets or small jars of yeast at the grocery and just keep it in a sealed container in the fridge. Works like a charm! Anyone have anything I can put on my 2 dogs when they are outside? They love being outside, but the flies cover both of them and I have to bring them right back inside. These 2 babies are not happy when the are in the house all day. Thanks! Hi Jill, have you ever had an issue with bees going into the trap? I’m having an issue with flys around my garden and would like to put out some of these traps, but I wouldn’t want to trap any bees. Thanks! Haven’t tried this yet, but I’m glad I found it! I love a couple blocks down from Cheyenne Frontier Days and they bring in lots of horses and cattle and with that come flies, it doesn’t help that I live in a garden level apartment. Hopefully this will work! I’m trying this right now! These damn flies drive us crazy! I can’t wait to try this out! We have a severe drought and it seems to be making the flys extra crazy. Various forms of this reversed bottle trap exist. All seem to work. I like to put in sugar water or sweetened liquid to attract flies. When I’m sitting near the trap, adding a bit of yeast creates CO2. The gas makes most flies and mosquitos think there is a human in the trap, waiting to be chewed on. They fly in, but they can’t fly out! I don’t know if this is considered toxic, but inside the house I leave a cup of apple cider vinegar watered down (super smelly!) and a dash of dial dish soap. I catch house flies and gnats daily and change out every week or so until flies are gone! This has transformed my life, no joke! We had so many flies in our kitchen and we couldn’t work out where they were coming from, cleaned and cleared everything we could think of, but still they came. Just about to buy some electrical repellant things online when I come across this… made a few and dotted them about, within two days the bugs are GONE! My son was grossly curious about these and thought I was amazing and so clever to make them. Will remember this trick and use it again! Gonna give this a shot tomorrow, been fighting flies for 30+ years here in Duval, maggots in the can, I’ll post how it goes, thanks for the info everyone! !!! First, Is that wayyy too large of a bottle for me to use? Also… Does the squarish shape matter at all? The opening & it’s cap (Which I know needs to come off the “Funnel part,”) Is clearly a much larger “Entrance” compared to a standard 2 Litre’s cap & opening, So will that make it easier for a fly to get back out in comparison to smaller bottle traps I’ve been seeing online? I spilled some coffee with sugar and milk on some dirt, and the flies really swarm on it. Maybe a good idea for bait. Thanks for sharing. That is great to know that those are options for getting rid of flies too. May come in handy if I do not have apple cider vinegar on hand. 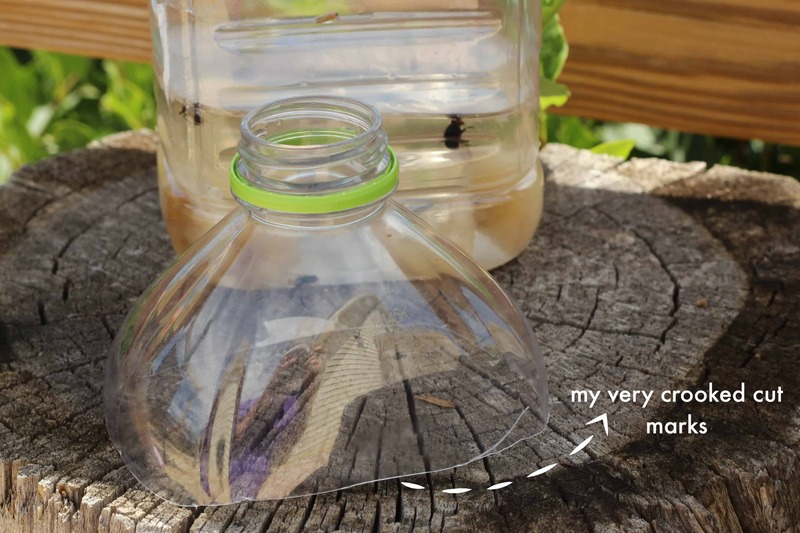 hello ……im in UK …..my homemade fly traps are old jars ……..I just puncture holes in the lids add some vinegar and a banana skin and put the lid back on ……..works a treat ……..I have used the plastic bottle version if its a waspy year but I find shouting at them works just as well !